The Flash 100th Ep Ends With Nora Bombshell: What Comes Next? "The Flash" 100th Episode: What's Next? Well well well, Nora WestAllen. What are you up to? Tonight's 100th episode of The Flash turned out to be a little more than just a trip back in time. It also revealed a few important things that will likely be a pretty big deal for this show at some point. Nora (Jessica Parker Kennedy) is secretly working with Eobard Thawne (Tom Cavanagh, 1/7), who's stuck in a prison cell in the future. It seems like she's been sending him messages through her journal, which is all written in a time language she invented—the same symbol-filled language Barry was writing in when he came back from the Speed Force last season. Apparently, whatever's written in it won't change even if the timeline does, and she's been sending messages written in that language to some mysterious recipient. Nora's involvement with Thawne is a pretty big deal for the series, as the cast told us during the episode's celebration party. "The teaser at the end is gonna rock the season and the series, being that Eobard Thawne is not only around still, but potentially working with Nora in some capacity," Grant Gustin told us, though the show hasn't broached the subject again in the episodes that have been filmed so far. "I can only imagine it's gonna be pretty ugly." 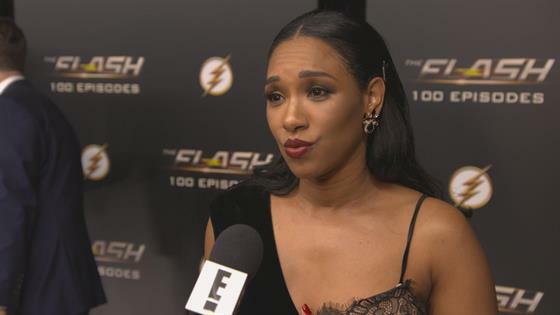 "There's a lot of mystery surrounding Nora and what her intentions really are, who she's working with, why she's really come back to the past to visit everyone, so I feel like this is kind of the set up for the rest of the season in dealing with that," Candice Patton told us, adding that she can't wait to find out how it affects Iris and her newly repaired relationship with her daughter. Tom Cavanagh, who also directed the episode, claimed it's a good thing for the show to know that Thawne is still wreaking havoc. "I think that Batman works best when Joker could show up, or Lex Luthor could show up for Superman," he said. "And for us, having the shadow of Reverse Flash as the arch enemy somewhere near Barry or just coming over him, I think that's a good thing for our show, and also for my bank account." Executive producer Todd Helbing confirmed that Thawne "starts to play a bigger part in the back half of the season." "We'll explain why he's working with Nora and why she went to him and what their relationship really is," he said. "It's a lot of fun." As for the time travel tonight, we couldn't even begin to explain to you exactly why this trip was needed. Cicada's power-dampening dagger is made of dark matter, and the team needed a power-dampening dagger power dampener to get the dagger away from him, so they had to go get a piece of Savitar's suit and Zoom's speed force transmitter, then store the new power-dampening dagger dampener at the hospital where they knew Cicada could be found. On the way, the speed force transmitter got broken, and they had to go track down Eobard Thawne to fix it, which led to a fun awkward scene in the time vault. Past Barry was unconscious on the floor, and Eobard couldn't get over the fact that Nora wasn't Dawn, the WestAllen kid he remembered (and the name of Barry's daughter in the comics, alongside her cruelly named twin brother, Don). In the end, the dagger dampener did work, but only for a hot second. Cicada quickly retrieved his dagger and escaped, so it was all for nothing. But it was fun, at least. And just in case anyone else was confused by Sherloque's reaction to Nora and the use of the phrase "clever girl," just like Thawne, Sherloque is not Thawne. He is his own (annoying) dude, but you'd be forgiven for thinking/hoping there was something more nefarious going on with him. Hit play on the video above for more from the cast, and for everything we know about the crossover after that last tag, we got you! The Flash airs Tuesdays at 8 p.m. on Tuesdays, though next week's crossover episode will air on Sunday at 8 p.m. on the CW.